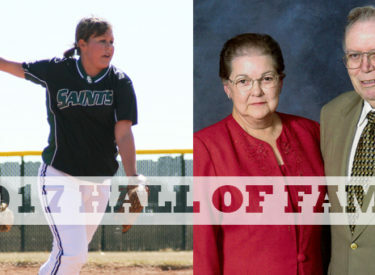 Three more Saints will be inducted into the Saints Athletics Hall of Fame in April as at Seward County’s home basketball games against Colby on Saturday, contributors Bill and Virginia Colvin as well as softball player Courtney Auger were announced as the Saints Hall of Fame Class of 2017. Familiar faces to all long time Saints and Lady Saints fans, the Colvin’s played a major role in the development of Seward County Athletics throughout the years. Providing support in a number of different ways for SCCC, the Colvin’s contributed countless dollars to Saints and Lady Saints athletes from the purchasing of Championship rings to feeding Seward County teams all over the country at their Pizza Hut restaurants. The Colvin’s helped build the Colvin Adult Learning Center on campus, have contributed to the SCCC music department to provide bands for the games in the Greenhouse, as well as being mainstays in the green seats during Saints basketball games over the years. Auger finished her Seward County career ranking 1st or 2nd in every major category including being the all-time leader in both wins with 46 and strikeouts with 558, which at the conclusion of her career was more than double the next highest total. Her career line with the Lady Saints was as follows: 46-15, 1.52 ERA, 380 IP, 558 K’s. She holds the top two single season strikeout marks in school history and two of the top three ERA places. Auger was named the Jayhawk West Most Valuable Player in both of her seasons with the Lady Saints and was a 3rd Team NJCAA All-American in 2009 when she led Seward to their first ever trip to the NJCAA National Tournament. The Colvin’s and Auger will be officially inducted into the Saints Athletics Hall of Fame at Seward’s annual Hall of Fame Banquet on April 21st.